How does music of the Indus, Europe, and Central Asia mix? Surprisingly well. 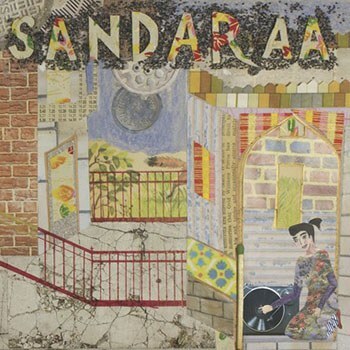 When you’ve decided to mesh the music of the Indus, Europe, and Central Asia together into one convenient -- if not surprising -- package, you would be hard-pressed to establish a band name better than Sandaraa, meaning “song” in Pashto. Marrying the klezmer clarinet of Brooklyn’s Michael Winograd and his revue of fellow instrumentalists with the vocal performance of Pakistani pop icon Zeb Bangash, Sandaraa have effectively aimed to live up to their name in producing compelling songs which meld the three aforementioned regions’ sounds together. The end result is astoundingly pleasant, engaging in a mystic musical foundation as it molds itself firmly around the quirks of modern western interpretation. Zeb and Michael are joined by drummer Richie Barshay, bassist David Lizmi, violinist Eylem Basaldi, guitarist and oudist Yoshi Fruchter, and keyboardist and accordionist Patrick Farrell. Together, they meld together a strangely compelling group of vast and exotic musical inclinations. Overall, the combination works out well in the musicians’ favor, and it will be interesting to see what avenues they explore next as a band.